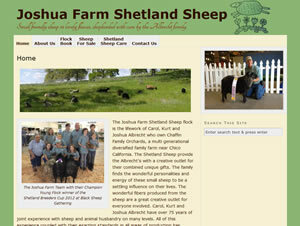 Overview: Joshua Farm primarily raises purebred Shetland Sheep and offers them for sale for breeding stock and fiber producers. Technology: This site uses the WordPress framework. WordPress plugins along with some customizations provide the Flock Book and Sheep For Sale sections of the site, which are managed along with the basic site content by the owners through the WordPress Admin interface.